Ever since I was a kid, I have always loved playing basketball. I played throughout high school and junior college. I couldn’t get enough of the game! In May of 2018, I played at a recreational league and during one game,I planted my foot, changed direction too quickly, and felt a pop in my foot as I was going for a lay up. Almost immediately, I experienced pain and swelling and was unable to weight bear through my midfoot and forefoot. The following day, I had an evaluation with a podiatrist, it was determined that I suffered a tarsometatarsal ligament or a Lisfranc injury (the injury is name after Jacques Lisfranc de Saint Martin). I didn’t think getting injured could ever happen to me! Just a brief anatomy review...the foot is broken down into three sections: the forefoot, midfoot, and hindfoot. The midfoot primary purpose is to transition from midfoot to forefoot with a locking and unlocking pattern in a normal gait. 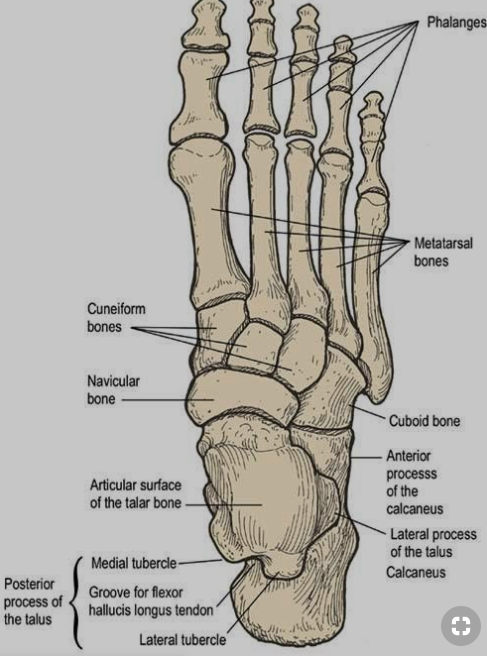 The midfoot consists of 5 tarsal bones: navicular, cuboid, and three cuneiform bones. The medial cuneiform is connected to the first metatarsal, the intermediate cuneiform is connected to the second metatarsal, and the third cuneiform is connected to the third. These articulations create the tarsometatarsal joints and are stabilized by dorsal and plantar tarsometatarsal ligaments. There may be multiple ligaments injured, but the Lisfranc ligament, specifically, connects the medial cuneiform to the base of the second metatarsal. After an x-ray, my orthopedist recommended an MRI which further confirmed my diagnoses. Since my first metatarsal and medial cuneiform separated medially from the second metatarsal and intermediate cuneiform, my midfoot complex was unstable and required surgery. I had to get a pin that went through my medial cuneiform to my second metatarsal. 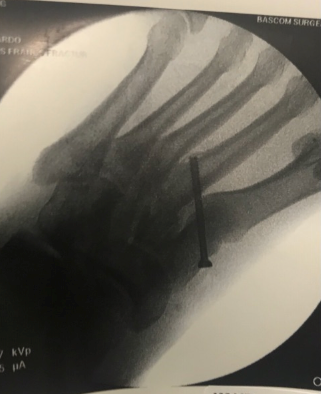 This pin was removed 4 months later through another procedure. 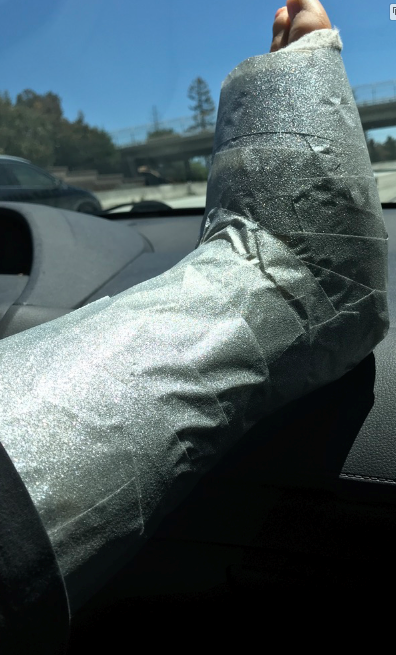 After the cast was removed, I needed a walking boot with crutches. I was able to wean off the boot and walk on my own after 8 weeks from my surgery date. As my incisions healed, I relied on swimming and biking as my cardio and continued with my rehabilitation exercises. Getting injured and enduring the healing process is never easy. The body doesn’t ever heal as fast as you want it to, and even as a physical therapist knowing the tissue healing timeline, I had many moments of frustration. I was quickly humbled and reminded multiple times throughout the process of all the things that I couldn’t physically do, and this bothered me. Witnessing my strength deficits made me feel almost defeated most days, and my usual outlets of running long distance and playing basketball seemed lightyears away. Throughout my rehabilitation, I needed daily reminders of the small goals I needed to focus on, and I needed to celebrate my small wins to maintain my sanity. I started to appreciate the little things that I was gradually able to do again, and these small things reminded me of my end game: running long distance and playing basketball. I can’t say it was easy, but I needed to celebrate walking without crutches, walking without a boot, wearing sneakers, walking barefoot, having the option of wearing cute shoes again, walking for more than a mile, and running after 6 months! In order for me to return to basketball and running, rehabilitation was key! Due to my foot injury, I knew I had some compensations I would have to deal with: I experienced some other knee pain and lateral foot pain. I didn’t want this to lead to further injury. This whole process reminded me that injuries can happen to anyone at anytime and it’s all about how you deal with it. Here at Competitive Edge, we have a wide variety of high tech tools that other clinics simply don’t offer so if you feel like you just can’t find a solution to your rehab we are the place to see. Many take advantage of our expertise and the best technology in the industry. Here I was able to use the IMU sensor technology which measures kinematic joint angles while walking, running, jumping, and cutting drills and that helped with my rehab immensely. I also utilized our force plate to define where my forces were being distributed throughout my foot and into all other joints of the lower extremity an extremely valuable resource at this stage of my rehab. I was able to use quantitative data to assist with my running and jumping form in order to improve my mechanics and minimize any other pain that I was feeling. Most importantly, through all of this I was able to make way better informed decisions for my rehabilitation exclusively due to using the data and that technology with the expertise here at Competitive Edge gave me all the tools to not just rehab efficiently but to minimize my chance of get re injured as well. I also increased my confidence to reach my long term goals after 7.5 months of my Lisfranc surgery just having the best perspective on exactly what's going on helps so much. Lastly even though the road was long and windy, I’m reminded of the importance of just keeping your feet moving and continuing with my program because before you know it you will be back doing what you love just like me! If you have any questions regarding Lisfranc, foot injuries, or anything about Competitive Edge Programs or technology please feel free to call our clinic here in San Jose 408-784-7167, email me directly at An@compedgept.com or visit us online at www.compedgept.com.